This fall, the Holocaust Living History Workshop (HLWH) at the University of California San Diego once again launches its year-long series of educational events composed of eight seminars, a documentary film screening and a photography exhibition underscoring this year’s theme, “History, Memory & Meaning of the Holocaust.” The series, now in its tenth year of programming, is presented by the UC San Diego Library and the UC San Diego Jewish Studies Program. This year’s seminars approach the history of the Holocaust in terms of layers of meaning that are constantly being written, erased and rewritten. Each workshop draws on the expertise and experience of distinguished scholars and survivors/witnesses of the Holocaust. Whether the topic is a photographer’s journey to the Lithuanian killing fields, individual acts of resistance against Nazi oppression in the Third Reich, or the experience replaced with memories of a Yugoslav child survivor, memory and meaning provide the signposts in their attempts to make sense of the past. HLHW events aim to preserve the testimonies of victims and survivors of the Holocaust, allowing their firsthand stories to enlighten and inspire action against intolerance. All workshops are free and held in Geisel Library’s Seuss Room from 5 to 7 p.m. unless otherwise noted. 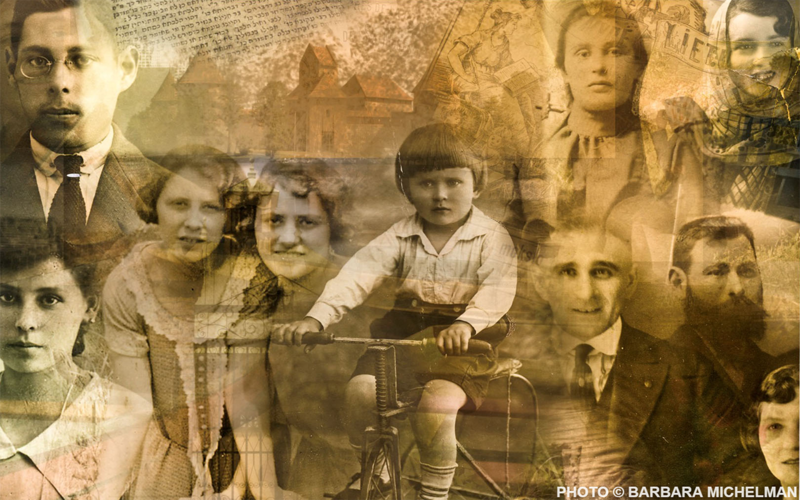 Our first event this fall features photographer Barbara Michelman who will share the story of her father who was born in the village of Paneriai, the site of one of the worst massacres of Jews during World War II. For Michelman, Paneriai is a landscape of loss and silence—a silence exemplified by her father who was born there. Though he escaped the slaughter, he was haunted by the tragedy. After a trip to Paneriai in present-day Lithuania, Michelman was so moved by the experience that she converted her feelings into art. In her solo exhibition, “Past is Prologue,” Michelman showcases a series of photo montages made with a mixture of words and images, portions of old letters, documents, names of people and towns, all echoing the voices of the vanished. In addition to Michelman’s lecture on October 10, part of her exhibit will be on display in Geisel Library’s West Wing on the 2nd (main) Floor from September 24 – December 13, 2018. Michelman’s lecture on October 10 is preceded by a tribute to Dr. Edith Eva Eger, a prominent clinical psychologist, motivational speaker and survivor of the Holocaust. Dr. Eger is the author of the award-winning memoir “The Choice: Embrace the Possible.” The tribute begins at 4:30 p.m. Registration is required for the pre-event and lecture. Register at hlhw-michelman.eventbrite.com. Lodewyk “Lou” de Beer, the son of American parents, was born in Amsterdam in 1931. He witnessed the arrival of the German troops in 1940 and lived through the dark days of occupation. When the U.S. joined the war, the de Beers were declared enemy aliens and subjected to a lengthy odyssey through concentration and internment camps. On the periphery of WWII and the Holocaust, Lou caught glimpses of devastation and oppression without fully grasping their significance until he experienced the hardship of war firsthand during his service in Korea in the 1950s. His journey adds an important and generally overlooked angle to the history of WWII in Europe. The talk will be recorded and available for viewing through the UC San Diego Library’s Digital Collections. This event is preceded by a book introduction featuring Judith Hughes. In “Witnessing the Holocaust,” Hughes presents the writings of individuals like Victor Klemperer, Ruth Kluger, Michal Glowinski, Imre Kertész and Béla Zsolt. The pre-event begins at 4:30 p.m. Registration is required for the pre-event and lecture. Register at hlhw-debeer.eventbrite.com. The UC San Diego Library is one of only three university libraries on the West Coast to have access to the Visual History Archive, which includes around 55,000 testimonies of survivors and witnesses of the Holocaust and other genocides. Members of the campus community and the public can access the testimonies conducted in 64 countries and in 42 languages ranging from Bulgarian and Greek to Japanese and Spanish, from any computer on the UC San Diego campus. For more information about UC San Diego’s Holocaust Living History Workshop, contact Susanne Hillman at shillman@ucsd.edu or (858) 534-7661. To register for the events by phone, contact Ellysa Lim at (858) 534-1183.